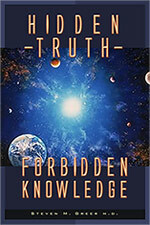 Hidden Truth - Forbidden Knowledge by Steven Greer is THE book anyone interested in the phenomenon of UFOs should read, before reading any (more) other books on the subject. Whether you believe in the government information that there is no such thing as UFOs or are a convinced "UFO buff", don't miss the information Greer has collected in his decade-long search for the truth. Dr Steven Greer is an emergency room physician who has made disclosure of the reality of continuing contact between extraterrestrial beings and humans and the achievement of universal peace - peace not only on earth but peace in space - a goal of life he is pursuing with vigor. The book can be found on Amazon but also on Greer's own Disclosure Project site. Dr. Greer relates his own personal experiences with Extraterrestrial peoples and the unfolding of cosmic awareness since his childhood, aided by his sighting of a UFO at an early age and a personal near-death experience at age 17. Greer found and tells us about a secret cabal that escapes all government control but is deeply involved with the illegal transnational energy monopoly as well as the cover-up of all UFO-related information and projects. He has met with a CIA Director, US Senators, heads of state and royalty, only to find that while many agree with him about the importance of his work, he is alone in exposing the cover-up and bringing the reality of UFO contact to our attention. Greer tells about his method of contacting and inviting visitors from other planets. His Center for the Study of Extraterrestrial Intelligence (CSETI) is especially interested in the ETI-Human relationship and in the peaceful furtherance of this relationship. The book takes us out into the vast reaches of the universe and explains how those advanced civilizations communicate and travel - much different from the methods we have to date developed on our own. Humanity's future as a civilization depends on ourselves - we choose to be part of the inter-stellar community or not. Let yourself be pleasantly surprised by the clear, no-nonsense approach to the question of UFOs and the author's suggestions of how to approach the foreign visitors. Should you have any doubts about the reality of the phenomenon, please read Steven Greer's other books: "DISCLOSURE" and "EXTRATERRESTRIAL CONTACT" which document reports of observation and contact by reliable witnesses. I would also recommend you get "Fastwalkers" - a recently released feature-length video that documents the fact of numerous alien visits on this planet and of contact that has been established. You will hear first hand accounts of how the evidence is covered up by our governments, slotting the spiny question into a "national security", military category, where no real data is allowed to escape into our very controlled media and public knowledge. Steven Greer is one of the experts you will see relating their experience. According to Dr. Steven Greer, yes, SETI has received multiple extraterrestrial signals. This news he says, is confirmed by senior employees within the SETI program. "We have confirmation - and I'm not going to give the name yet because we are trying to coax this guy out of the closet - but one of the senior people in the SETI project, which is the Carl Sagan Search for Extraterrestrial project, has confirmed to the Disclosure Project that they have received multiple extraterrestrial signals," Greer said. In this excellent article, Michel Salla describes how the US intelligence agencies have, with a long-term program of disruption and debunking, effectively neutralized what seems to have been a perceived threat that people in direct contact with extraterrestrials could bring about changes in earth politics and social systems in preparation for humanity's entry into the larger community of space civilizations. Not only did the US authorities know that the extraterrestrial presence is real, they did everything to ridicule and split UFO investigators and set them against each other. I have read this book and Dr Steven Greer's revelations are truly incredible. Not only on the UFO/ET subject but also some accounts of his personal life. I would also advise anyone interested in knowing more to search on Google Video and YouTube for videos with Steven Greer or The Disclosure Project.